I just can't let Summer slip by without including my all-time favorite Summer song as a Music Monday selection. 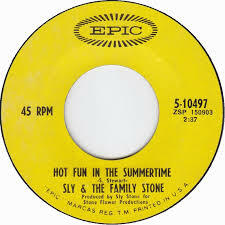 "Hot Fun in the Summertime" was released by Sly and the Family Stone after their appearance at Woodstock. This was a very popular song, hitting number 2 on the Billboard Hot 100 chart. And it is one of my favorites! Do you remember this one? I always loved this song and especially the lyrics. End of the spring and here she comes back, first of the fall and then she goes back. Classic piece of great pop music. I'm not very familiar with this song, but I DO like it! I never knew just how many songs were popular about summertime back in the day. Thanks for the visits and comments! Bob, those are the lyrics I love the most too.